Pondus is a Norwegian comic by Frode Øverli. It is usually drawn as single strips, and is published in more than 130 newspapers and periodicals, it has its own magazine, and is also printed as booklets and albums, where longer stories can be found. – So, you’ve stuffed the machine aimlessly and boiled all the clothes? – Yeah! You can’t get it any cleaner! 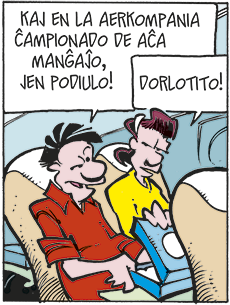 The character of Pondus was born in 1995 in the comic A-laget, which focused on three football supporters. But since October 1995 the comic has been called Pondus, and the main character Pondus and his buddy Raymond have broadened their horizons with work, family, friends, neighbours, beer and women. But football still plays an important role in the strips. Pondus has been translated to several languages, for instance Swedish, Danish, Saami languages, French, English, Latin and Esperanto. 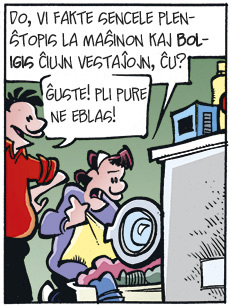 The youth pages Inter ni dirite of Norwegian Esperanto League’s members’ magazine have published comic strips in Esperanto since 2009. Now finally the album is here. The new album contains strips orignially published in Norwegian in the period from 1998 to 2005. Pondus is a living football encyclopedia. His favourite team is Liverpool. He plays football at old-boys level together with hus buddy Raymond. Pondus is a bus driver and is married to Linda (Norwegian: Beate). They have two children: Junior (Kevin) and Rugrat (Frida). Pondus’ wife. Works as a nurse, and is constantly exposed to the trials of living with a football fanatic, a teenage son and a one year old baby. Their son. He is now in that particular age when girls, in short glimpses, may be more fascinating than football. Observes the world in her own perspective, diagonally from below. Raumond’s mom. An iron lady with a dubious wardrobe. Bathrobe and slippers are used everywhere. Elsa’s husband, Raymond’s stepfather. German dwarf with an affinity for high heels and babydoll. Preferably on himself. Best buddy of Junior. He’s a hopeless romantic and struggles with huge acne problems and extreme short-sightedness. You can read more about Pondus on the Wikipedia.